As parts of the yield curve begin to stay inverted, more investors start asking the same question: Is a recession finally coming? As an economist, I do value what the yield curve says. However, in my view, the current shape is still inconclusive as the curve is only inverted at certain points along the line. In addition, there may be some technical explanations for higher short-term rates, while outside forces contribute to lower long-term rates. For example, the global economic slowdown is resulting in greater easing outside the U.S., which is generating more demand worldwide for risk-free assets such as U.S. Treasuries. This has the effect of pushing down long-term rates. As for short-term rates, I find it interesting that recent new U.S. government borrowing has been serviced in the very short-term debt markets, an unusual move that could help push short term rates higher. But does the reason really matter? Who knows, it’s just a ready-made excuse if pundits are wrong. I believe an inverted yield curve that includes 10-year Treasury bonds minus 2-year Treasury bills (currently at 0.16%) and that persists for longer than a few weeks is very telling for predicting a recession. But even then, based on my research, I believe it’s hard to move beyond the “if” to the “when.” And that “when” of a recession occurring can be 9 months to 3 years, or longer. There are even more challenges in using the yield curve as the only indicator for an impending contraction. Some of the greatest rallies have occurred when the yield curve was not fully inverted, but very close to being inverted—thus making the prediction even riskier. Look at it this way (and my apologies for using a morbid example). Predicting someone’s date of death is very difficult. If someone has bad health habits, eats unhealthy foods, has high cholesterol, is severely overweight, etc., then the conventional wisdom is this person would likely have a short life expectancy. But even that information couldn’t predict the “when.” Add in additional high-risk behaviors—smoking very heavily, for example—and the combination of medical evidence and actuarial science narrows the life-expectancy window. Now, back to the economy. An inverted yield curve acts like an unhealthy diet for the life expectancy of an economic expansion. It probably does reduce how long the expansion will “live,” but it’s very hard to say when it will come to an end. But what if there are other warnings (akin to high-risk health behaviors)? As we analyze the economic data, if data points indicate the economy is beginning to falter, this information—along with an inverted yield curve—could mean a recession is closer. At Astor, we aggregate a plethora of economic data to generate a value that becomes the Astor Economic Index®. As the chart (above) illustrates, the AEI has been declining over the past several months but continues to indicate above-average economic growth (when all data points are aggregated). So, what does this mean? Based on historic trends, even average economic growth still generally creates a positive expected return for stocks. The economy and bull markets could, in theory, live forever and not die of old age. Expansions, as the saying goes, historically “get murdered.” The suspect could be the Fed, White House policies, global economic slowdowns, or a cascade of simultaneous bad decisions by businesses, banks, and consumers. But an inverted yield curve, acting alone, won’t be the culprit. As always, we at Astor will be monitoring the economy closely. To see more of our collection of charts, visit www.astorim.com/charts or download the Astor Economic Research App from the App Store or Google Play. The Astor Economic Index® is a proprietary index created by Astor Investment Management LLC. It represents an aggregation of various economic data points: including output and employment indicators. 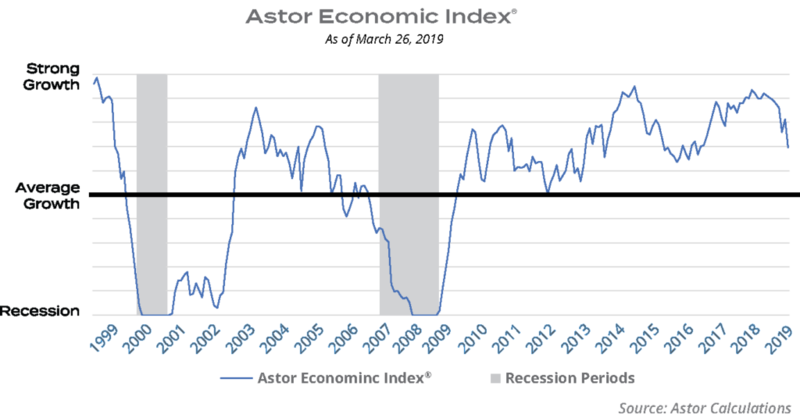 The Astor Economic Index® is designed to track the varying levels of growth within the U.S. economy by analyzing current trends against historical data. The Astor Economic Index® is not an investable product. When investing, there are multiple factors to consider. The Astor Economic Index® should not be used as the sole determining factor for your investment decisions. The Index is based on retroactive data points and may be subject to hindsight bias. There is no guarantee the Index will produce the same results in the future. All conclusions are those of Astor and are subject to change.